why do they have to be mutated thou, because that happend in G1? 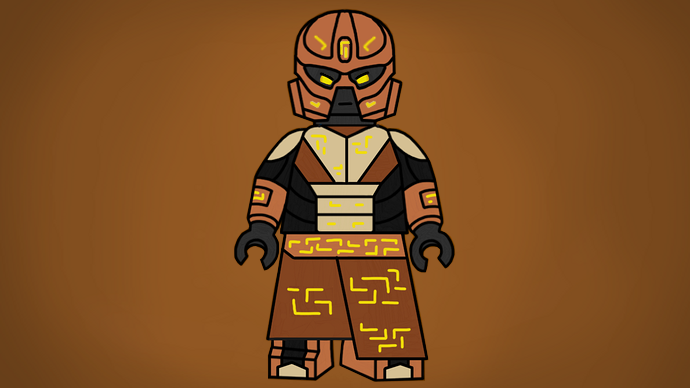 This is Brickonicle. You don't have to copy all of the story material from where they originated from. The Rahkshi for example are no longer worms that are made by Makuta which controls suits of armor, now they are matorans transformed into new beings, which is a big change from their G1 counterparts. I do agree that they don't have to be mutated by necessity, but the Mahri-Nui pitch does incorporate most of the G1 elements from 2007. If the Barraki are underwater, they'd have to breathe it, and if they're going to be water-breathing villains that are antagonizing the Matoran, it doesn't really make sense to not mutate them. It's a logical step. Plus, while the villains like the Rahkshi have been changed for G3, it's not as if the Barraki haven't. Their entire back-stories are different now. Just because G3 is trying to change things up doesn't mean some things shouldn't stay the same. I think the Barraki being mutated is essential to their character, as they were fallen warlords who once thought themselves mighty, but are now no more than monsters. If G3 is keeping that trait, then mutation seems like it should be kept. I feel being the guy that started the Trend with having ART written with capital letters in the title. @ZceeNook I did that to show what's new in the topic, as some might not want to read through all the 183 replies to know what's going on, or simply don't see any change in the base topic. I like this pitch. I'm also really jealous because I've been creating my own Barraki pitch, but I don't have any amazing art to go with it. I really really like the designs for Kalmah, Ehlek, Takadox, and Pridak. However, Pridak is really creepy. Now I know the red markings in G1 mean nothing, but on the minifigure's mask, I can't see anything but blood in that red. I know he's a shark, but I also can't shake the feeling he's a clown (my greatest fear). I do not think Lego would make Takadox and Pridak like this because they look really bloody, violent, and creepy. I do really like them personally. Also, I like how Carapar gives me a Davy Jones from Pirates of the Carribean feel. Mantax does not look like a warlord, but like some kind of priest, which I do not feel fits the Barraki characters. I do really like him, though. Ehlek is perfect. Good job, I'm picky over Ehlek. And Nocturn is pretty awesome, once I found out how to see all of him. Good job! Dropping a little teaser for Carapar's story, which is coming very, very, very soon! Created using a template by @Noupix Pretty much all credit goes to him! I've been working on a pitch for the Barraki, but I've been straying a distance from G1. I really like some of the ideas you have, so I was wondering if we could collaborate on some of the ideas. I'll be posting my ideas soon, maybe you could take a look at them and tell me what you think? MIiiiiiind if I borrow the concept for a big Theory.? I don't really like the idea of elements. Are they going to be important in the story, or just the cause of color scheme and homeland? For example, in G1, most of the Barraki obviously are elementless. Takadox is no water being, Pridak is not ice, Kalmah is not fire, and Mantax is not earth. I could see Carapar being stone, but Ehlek would not be air, and instead lightning. If you are going to be using these elements, I would suggest making Ehlek use lightning, though being from Kanae. Is Ehlek responsible for his parents' deaths? Also, Ehlek does not sound like that bad of a ruler, he fortified one of the least fortified regions. I don't know why Lesovikk would take him down. That is, unless he poisoned his family, and was unwilling to step down. (upon further inspection, I've realized that Ehlek killing his family was implied, but it is never flat-out said. So, I like Pridak's story, but if he was overthrown by his own sister, wouldn't she become queen? (This is more of a need of clarification than an opinion). Why does Takadox hate Pridak? Is it because Pridak sees Takadox's one eye as not attractive and beautiful, so he roasts on him daily? Way to bring in those 08' references! Just wait until Gorast becomes Ehlek's wife, or Gavla becomes Takadox's daughter. I'm not really sure about Nocturn. I like Mantax, Carapar, and Kalmah, but I feel the Lightning Tribe is different. Here, the Lightning Tribe would be a secret, wouldn't it? I'm actually not sure. I just feel Nocturn should not really be a Barraki, and more of a pet of the rest. Just an idea, however. I don't really like the idea of elements. Are they going to be important in the story, or just the cause of color scheme and homeland? For example, in G1, most of the Barraki obviously are elementless. I don't get what you're saying. The Barraki here are Matorans, not some 'elemental beings'. If you don't like the idea of elements, say it to TTV, not me. I would suggest making Ehlek use lightning, though being from Kanae. Is Ehlek responsible for his parents' deaths? I've realized that Ehlek killing his family was implied, but it is never flat-out said. So, I like Pridak's story, but if he was overthrown by his own sister, wouldn't she become queen? She would and she does. Izotor (The next Kopaka) is her descendant. Takadox is simply not attractive. He is skinny and small. Pridak sees himself as a superior being (Not that he is) and views all others as inferiors. Takadox hates this about Pridak. The Story: I think you mean a pitch? Not a theory? Do as you please, maybe write that you were inspired here. What I mean is, the Barraki should not have elemental powers. I just feel their strengths should be in military command and combat, and little individual strengths for each one, like strength or persuasion. I do recognize the Matoran having elemental powers, but perhaps the Barraki would have lost them from being mutated or from being too out of touch with their element, being so far from home for so long. Most of that post was just a need of clarification. For some reason (probably Nocturn being called the "thunder king") I thought that you were suggesting the powers, which I feel is out of character. However, it is your pitch, not mine. What I meant there was that Ehlek's ability would be a result of his mutation or some other cause, not from his homeland. I tend to do that a LOT. It's weird. Thanks, I just like knowing every detail, it's a personal thing. Thanks for the reply, and sorry about being confusing. First of all, I would like to thank @Jon and @IllustriousVar for adressing this pitch for quite some time in the last Brainstorm. I very much understand what you were saying. I started this pitch off small, with some more basic concepts, and never thought it would get out of hand like this. So here we are, nearly 200 replies later. If/when the project does reach the end of 3-year plan, I hope you'll remember and come back to this pitch for some ideas that you would like. Thank you for letting us do this, it's been great fun! Matoran croupted by the infulence of kazahni. I dare say it will work. i personally am not liking on having the Barraki be connected to both the main island from the first three years and Karzahni. A pitch that i am working on has them not be connected to ither of the three brothers, nor the island of the matorans. They are instead warlords from the world that is outside the boarders of the Matoran island. 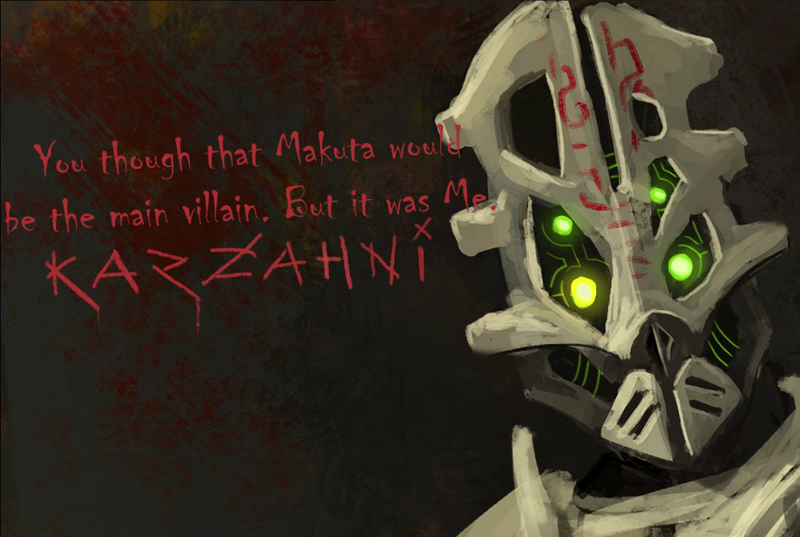 also, my problem with Karzahni is that it seems like people want to make him the big bad/bigger bad for G3, which im against because i think it should stick to what G1 and G2 did by having Makuta be still the main foe of the theme. Karzahni would instead be one of the three players on the three brothers game board. As im imageing the three brothers focusing on their own goals and each one tries to out manipulate the others. I think Makuta, Ekimu, and Karzahni should have a relationship based off the Greek gods, with Ekimu as the good guy Zeus, Makuta being the overworld equivalent of Poseidon, the bad guy, and Karzahni being a displaced brother, who is held in a bad light, and has been disowned by his brothers. Zeus was never really a good guy thou. Me personally, i see Ekimu more as the type of persion who wants to see how far his creations are able to go. Thus he causes events to happen in order to make his creations try to addapt and/or overcome it. even disguising himself as a mortal in order to sneak some ideas into selected Matorans to, for example, see if they can control lightning. If they fail and if some of the matorans die because of it, then he is just dissapointed that they failed his test. I'm also imagening him having a like able personality and behavior, but these hides some darker shades to his character. His like able nature could be why the Matorans would see Ekimu as a benevolenth great being. That’s almost exactly what I was going’s for. I was speaking from the perspective of the odessey, where Zeus helps Odysseus get home and Poseidon tries to stop him. Did you see the new Brainstorm. Wtf? No one's dying. TTV said we should stop the Barraki discussion, so we did. No big deal about it, they will most likely get back to them after the 3 year plan.